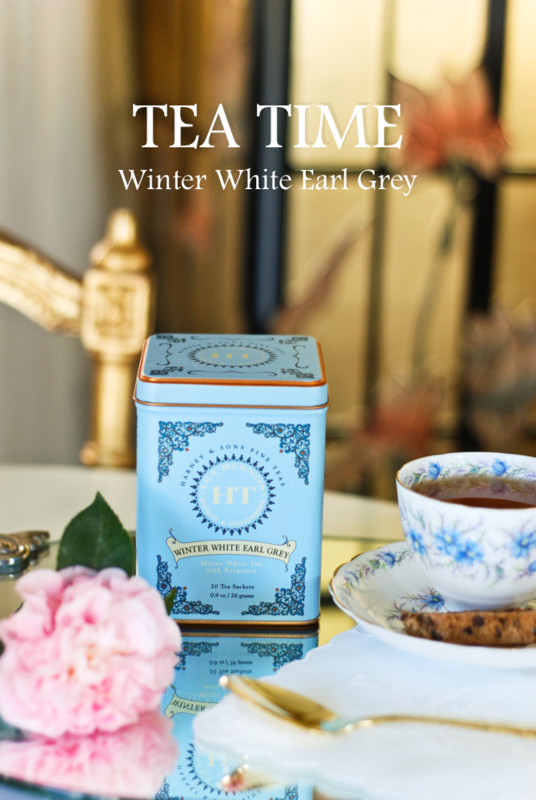 When I was attending the International Tea Festival here in Los Angeles last fall, I spent some time discussing teas with Emeric Harney at the Harney & Sons festival booth. Emeric runs the Harney & Sons shop on Broome Street in New York City, and he's responsible for blending the new Soho tea. I tried it for the first time at the festival and purchased it on the spot. Now I'm waiting for a shipment to arrive with a POUND of Soho tea because that's how much I love it. 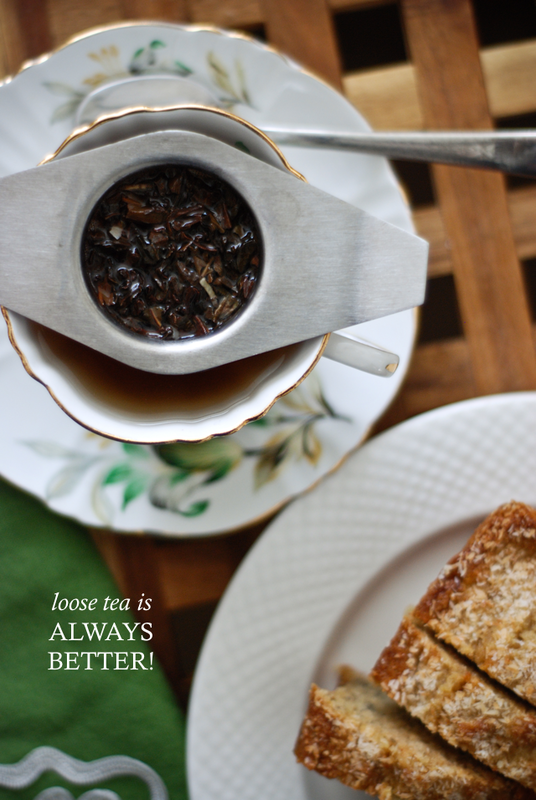 How could you possibly go wrong with adding chocolate and coconut flavors to black tea? The description from Harney says "This blend embodies the flavors of some of Soho's best sweet shops." As if I needed convincing! I don't know that there is much to say about English Breakfast Tea. It's a classic. Everyone loves it, right? I didn't become a serious tea-drinker until my first summer studying in London in my late teens. Each morning, I would join my fellow Shakespeare students in the breakfast room and a server would rush over with a hot pot of English Breakfast and a little caddy of toast. 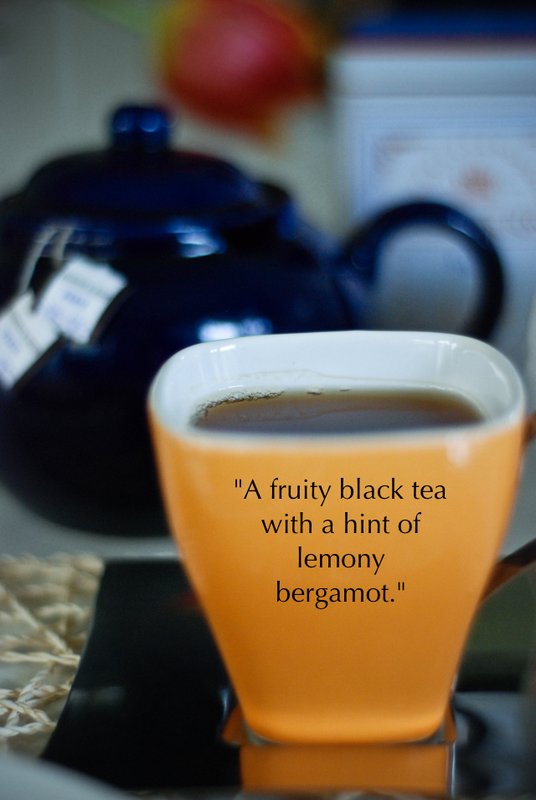 It became such a ritual, that to this day (over a decade later), I have trouble getting on with my day if I don't start it off with a cup of black tea. 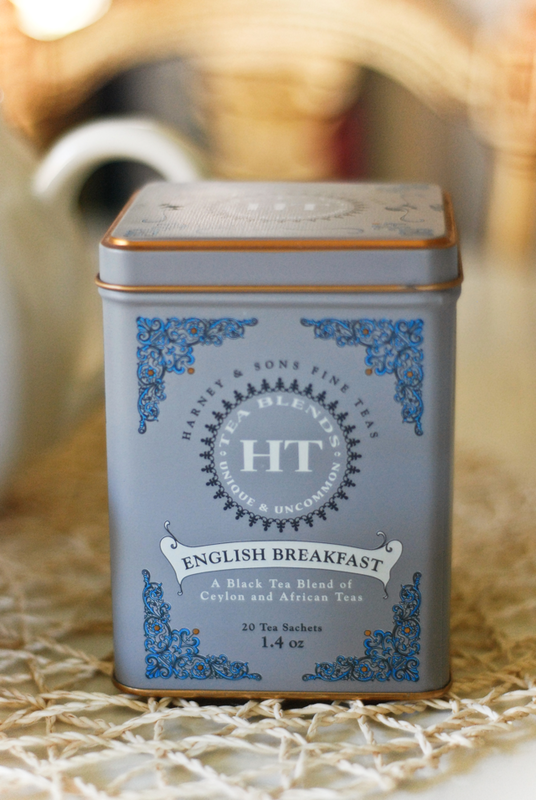 This particular English Breakfast, from Harney and Sons, is inspired by the same tea that the British began drinking regularly in the early 1800's- it's a Chinese black tea that is best enjoyed with a tiny bit of sugar and creamer. 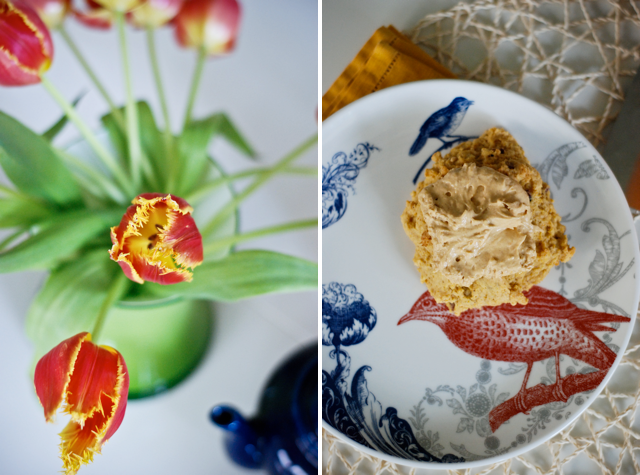 Images | Floral Design | Styling by Lauryl Lane. 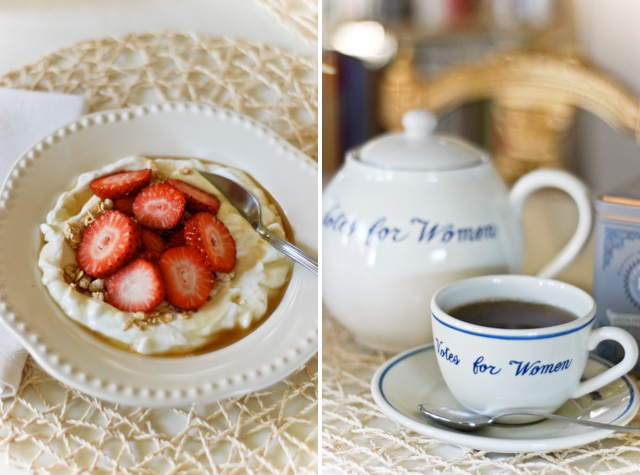 Votes for Women teapot and teacup from the Newport Preservation Society. When my dear friend Erin returned from a recent trip to Europe, she brought me this Othello Tea from Laduree in Paris. Now the Laduree on the Champs-Élysées was where I had my first French macaron the summer following my high school graduation, and to this day I define myself as someone who has been to Laduree-- so that's the backstory. I was certainly primed to love this tea, but OH MY it blew me away. Let me just share the ingredient list: India black tea, ginger, pink berries, cinnamon, cardamom. 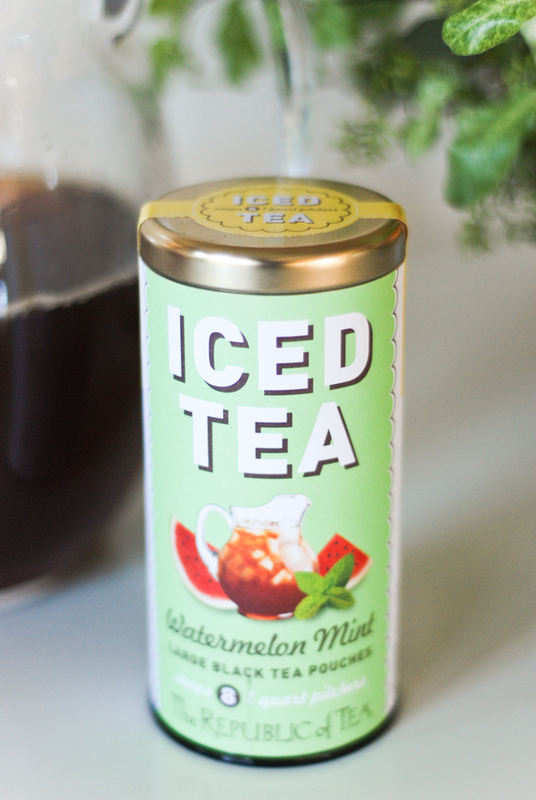 This is a spicy, full-bodied tea that I literally want to drink all day, every day. I can't get enough. I'm obsessed. White tea is rather a new thing for me. I'd tasted it before, but didn't really know anything about it until the recent tea sommelier workshop I attended. In fact, I didn't even know that the names of teas (like wines) are derived from their country or region of origin. White tea (or Bai-cha), by the by, comes from China. It's good. Really good. 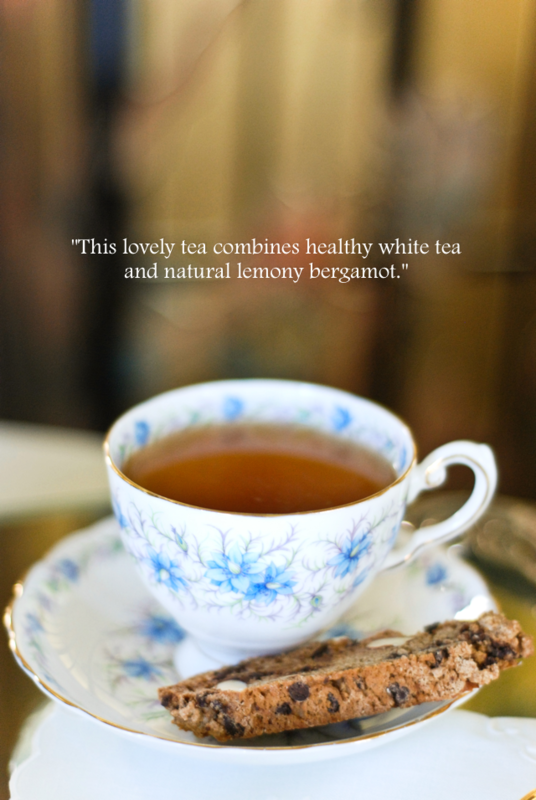 This particular blend from Harney & Sons combines mutan white tea with bergamot, giving it a light and citrusy flavor. 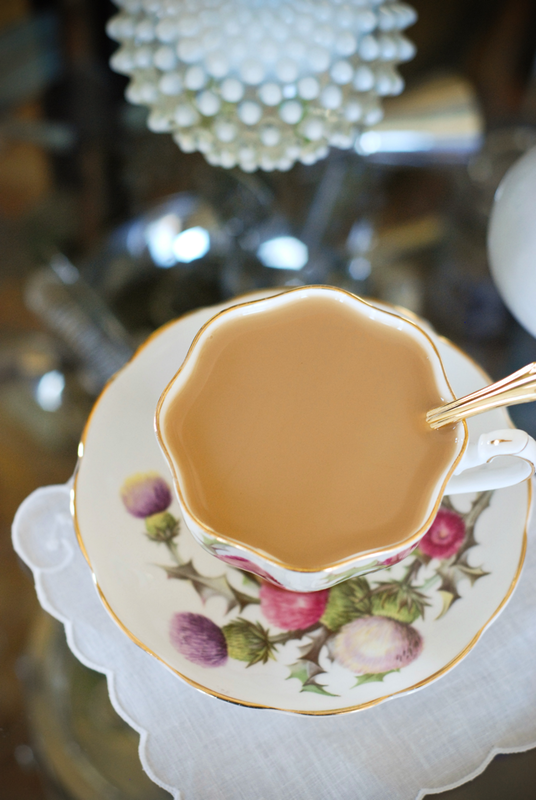 There are few things in life less pleasurable than pouring hot tea into a beautiful vintage teacup and sitting down to enjoy it. And this ruffly camellia bloom seems like the perfect floral version of this soft and luxurious tea. 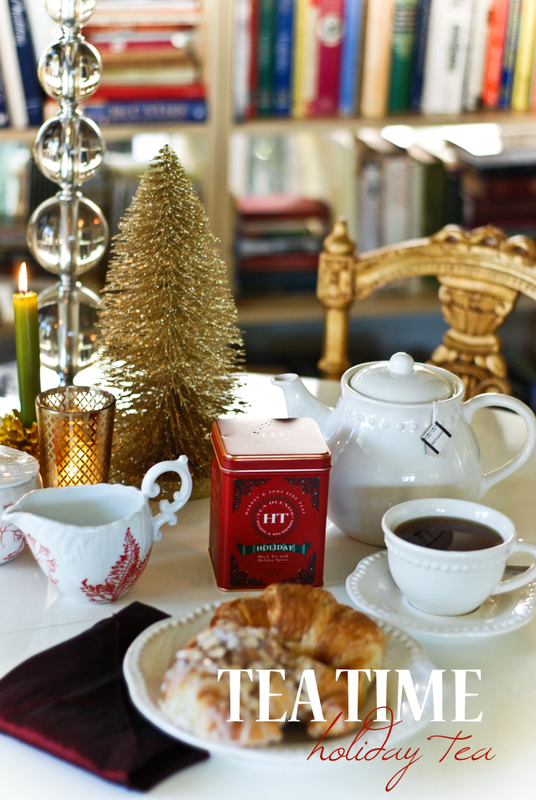 It seemed appropriate to introduce you to Harney & Son's Holiday tea during this festive season. 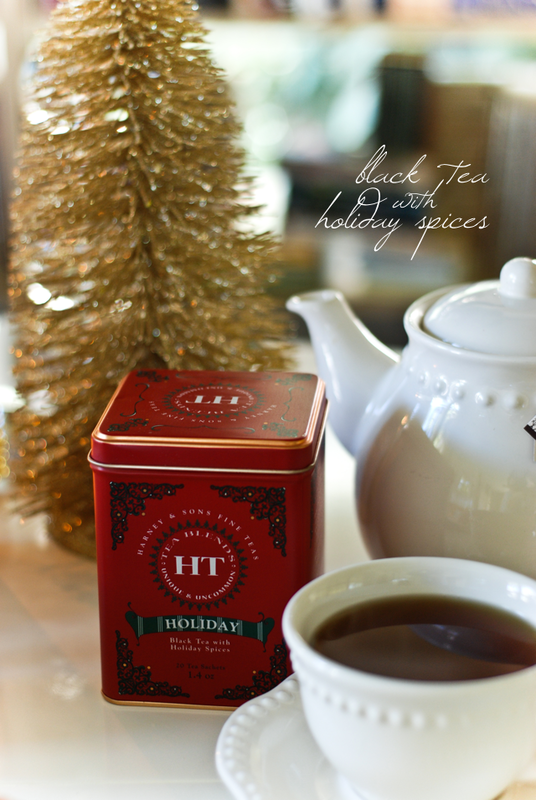 It's a sweet, spicy Chinese black tea with citrus and almond flavors and those christmasy flavors we all adore: cinnamon and cloves. Because it's so flavorful, I suggest that you enjoy it with a simple accompaniment: a buttery croissant is the perfect choice. 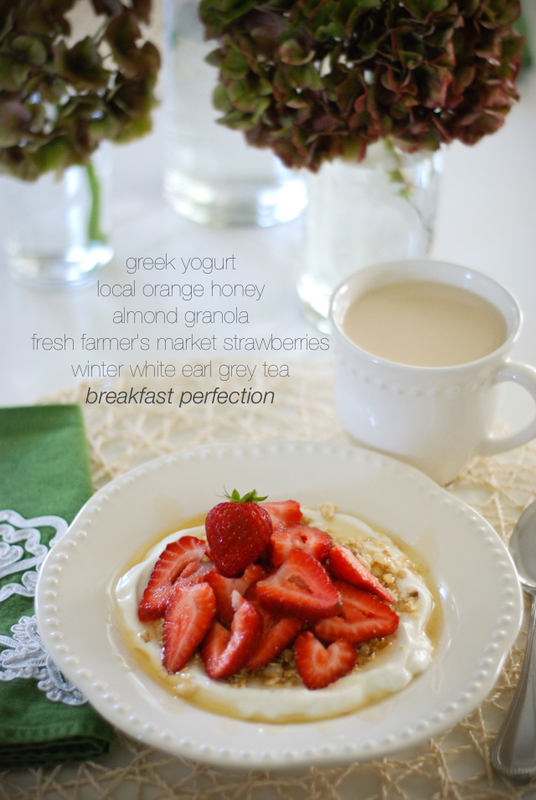 A pinch of sugar and a spot of cream make it a divine after-dinner tea, as well. 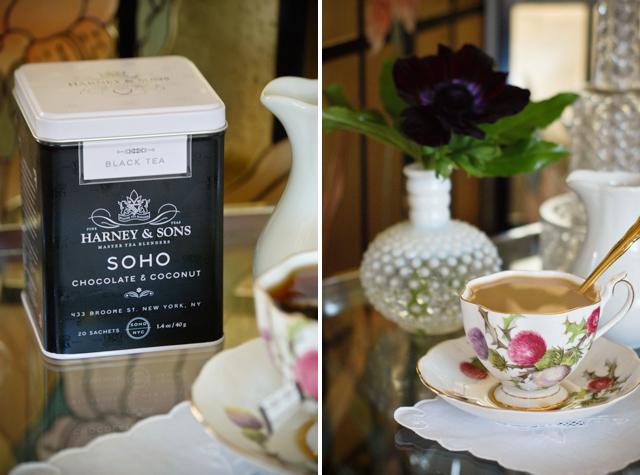 My mum and I were recently talking tea, and she said that Harney & SonsParis remains one of her favorites. I hadn't tried Paris in quite a while, so I decided it was time for a Paris tea time! Paris is a complex black tea with bergamot- it has hints of vanilla and caramel, but it also tastes slightly fruity and slightly citrusy. There's a lot going on, which makes it a delightful tea to repeat again and again. I enjoyed my tea with a tiny bit of turbinado sugar but sans milk, and ate a pumpkin scone with pumpkin cream cheese as an accompaniment. The day was overcast and a little drizzly, and after a run where I got pretty wet in a late-morning rain shower, my tea and scone were deliciously warm and comforting! I picked up this Lavender Dream Tea Bud at Breckenridge Spice Merchants the last time I was in Breckenridge, Colorado. The label reads, "Relaxing and fragrant lavender complements tangy hibiscus, enveloped by white tea." At $3.49, it was a tad pricy, although not bad if you really can infuse it up to 3 times, as suggested. Unfortunately I found a second brew too weak to drink, and therefore definitely did not attempt a third. But the first brew, well, it was a beautiful thing. It's always wonderful to watch a bud unfurl in your tea cup. I truly love that. Of course, I forgot that I would then need to strain the tea out, but that minor issue aside, once I had a nice strained cup of tea in front of me, I was in heaven. It really is a "dream" of a tea to drink. Velvety smooth with no need of sweetener or creamer, a light white tea with a lovely lavender flavor that was neither subtle nor overpowering. There really is something about lavender that takes the edge off. Paired with some mini pumpkin macarons, I would place this tea experience on my list of top 10 favorite tea times at home. Welcome to my new column, Tea Time! I am so excited about this!!! I love tea. As a young girl, my mother drank herbal teas at least once a day, and I was often asked to put the kettle on and bring a cup of chamomile or wild berry zinger to her while she worked in her art studio. I enjoyed tea back then, but it wasn't until I arrived in England to study in my late teens, that my true love affair with tea was born. My extended stays in London and Stratford-Upon-Avon immersed me in a land where people stopped what they were doing in the middle of the afternoon and DRANK TEA. 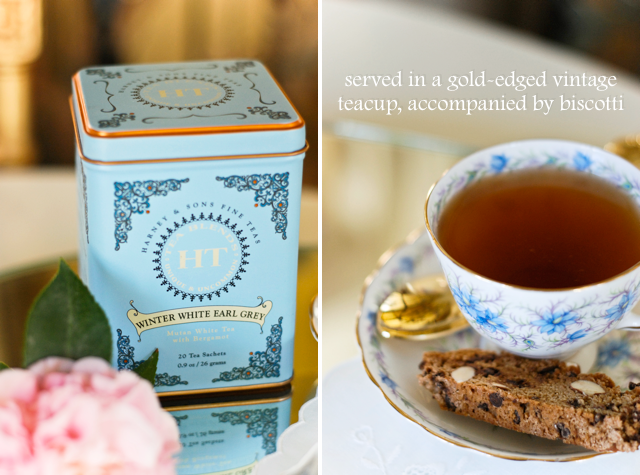 I have delightful and delicious memories of tea at hotels, tea at tea rooms, tea at the National Gallery, tea at the Orangery at Kensington Palace... there was always tea, every single day, and after two summers of that, I was hooked. I love drinking tea: but I also love the ceremony of tea time. I love drinking from a pretty teacup. I love the act of heating the water, pouring it over the tea leaves, stirring in milk and sugar. I especially love taking time to relax, sip, let the world around me go on hold for a few minutes... 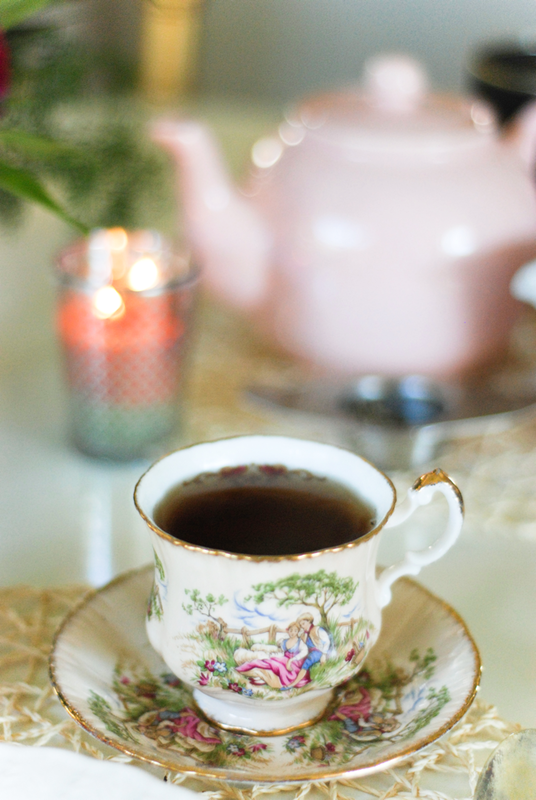 Tea time can be a very private and soothing ritual, but it can also be a beautiful social activity. My close friends would tell you that I almost always offer a cup of tea when they drop by my house. In this column, I'll share pictures and info about my favorite teas, and perhaps some nibbles to accompany. In this particular case, I enjoyed a smooth black tea with a hint of coconut flavor (subtle, not overpowering) from The Spice Station here in Silver Lake. I've been on a coconut kick lately, and this tea has been feeding my craving. The banana bread with coconut was purchased at Gingersnap Bakery, right down the street from me. It was such a perfect accompaniment, with the coconut again being a subtle added flavor. I don't think I would normally pair a tea with a treat that had the same flavor, but in this case it really worked. Yum, yum! Do you know how to brew a good cup of tea? Do you drink tea regularly? Do you want to know what temperature your hot water should be or where to get the best tea accoutrements? Let me know if I should share more about the process of preparing tea, or if you'd rather I just stick to favorite teas! I am slowly but surely getting back into the swing of things as I settle into my new home in L.A. and pick up with work. Part of the process of getting "settled" includes setting routines: especially important for those of us who work from home, and perhaps even more important for those of us who are "creatives." My natural inclination is to approach my day willy-nilly, but as that usually means that I don't accomplish everything that needs to be done, I try to stick to a routine as much as possible. My morning routine involves a run around the Silver Lake reservoir, followed by some mellow time for eating breakfast, reading the paper, and considering the day that lies before me. I'm not a morning person, so taking the time to "be" each morning is essential for me to get into the right head space. Devoid of the usual kitschy quality you find in most state-side tearooms, the House of Commons is a fresh, clean space in the Lower Highlands neighborhood near Downtown Denver. I ordered the Afternoon Tea, and enjoyed a smooth spiced orange black tea while nibbling on dainty tea sandwiches such as cucumber, smoked salmon, and curried chicken. My husband opted for the refreshing Chatsworth iced tea and a hearty ham sandwich dubbed the Westminster. The mini scones were fluffy bits of perfection, and since finding anything even resembling Devonshire cream has been pretty non-existant for me here in Colorado, I was definitely in Devonshire-cream-heaven. 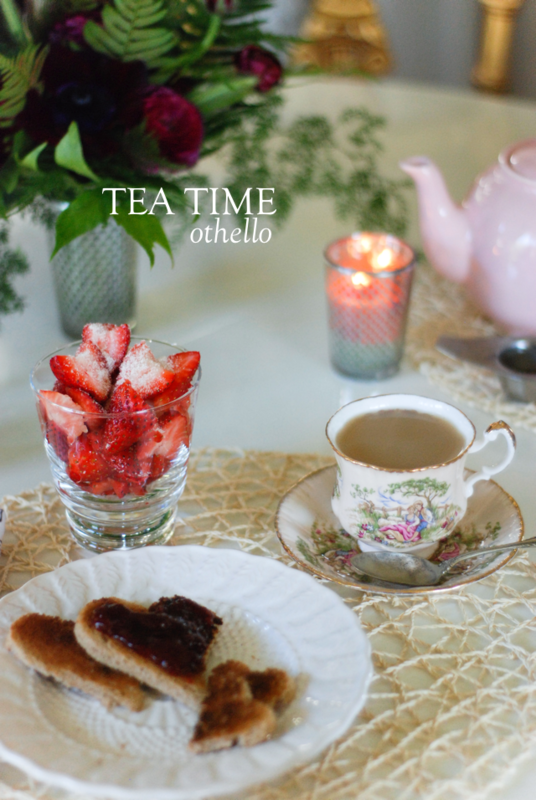 I flashed back to my college days and sitting for hours at a little tea room in Stratford-Upon-Avon with my girlfriends, discussing Shakespeare and gorging ourselves on tea and scones. Although the House of Commons has a very updated, modern look, it still seems quintessentially British, and that feature, paired with the lovely tea and yummy tidbits, will definitely draw me back again in the very near future. Sometimes you enjoy lunch with a friend, but your need to converse lasts much longer than your need to occupy a table at a busy restaurant. On just such a recent occasion, Jane suggested that we try a new coffee shop in nearby Little Tokyo so that we could spend some time relaxing and getting caught up. Cafe Demitasse was the perfect place for such a plan. It was a warm and sunny day, so after procuring our own individual carafes of iced tea, we settled in on the patio to chat and people-watch. The patio was full of slatted wood furniture and surrounded by succulent sculptures, many of which were mounted on the walls of the building. It was a serene little spot in the midst of the busy city. The barista guided us to the best tea blends and his recommendations were spot-on!